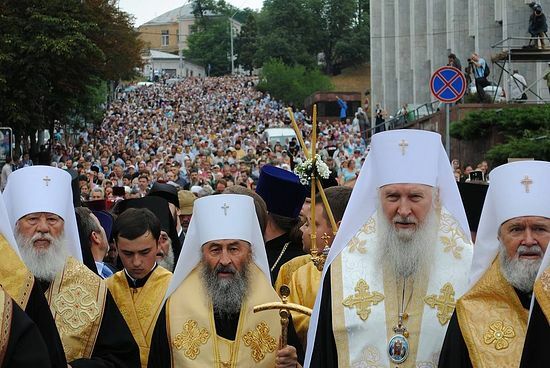 Moscow, June 14, Interfax - One-third of all clergymen, two-thirds of all Orthodox parishes, three-fourths of the students of spiritual education establishments belong to the Ukrainian Orthodox Church of the Moscow Patriarchate, the Ukrainian Culture Ministry said in its report. Over 10,200 clergymen and over 12,600 communities belong to the Ukrainian Orthodox Church of the Moscow Patriarchate. The number of the latter is twice as high as the total number of communities of all Orthodox religious organizations (Old Believers, and also the Kiev Patriarchate and the Ukrainian Autocephalous Orthodox Church, which are not recognized in the Orthodox world), the press service for the information and education department of the Ukrainian Orthodox Church said. A total of 4,807 monks and nuns live in 208 monasteries of the Ukrainian Orthodox Church of the Moscow Patriarchate, which is 20 times more than in all other religious organizations that call themselves Orthodox taken together. A total of 4,788 people, one-fourth of all students of religious Ukraine, study in 19 spiritual education establishments of the Ukrainian Orthodox Church of the Moscow Patriarchate. This is 75% of all Ukrainians who are studying to receive an Orthodox education. The Ukrainian Orthodox Church of the Moscow Patriarchate has founded 3,986 Sunday schools and 135 media outlets. “The official statistics of the Ukrainian Culture Ministry confirms one undisputed fact: despite the massive encroachments on the rights and freedoms of believers of the Ukrainian Orthodox Church registered by international monitoring organizations, the Ukrainian Orthodox Church is a largest religious organization that boasts dynamic development and spiritual potential,” Bishop Kliment of Irpen, the head of the information and education department of the Ukrainian Orthodox Church of the Moscow Patriarchate, said.